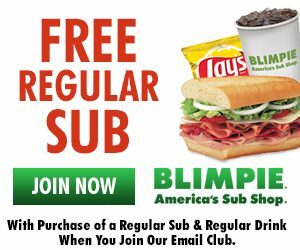 FREE Blimpie Sub With Purchase! You are here: Home / FREEbies / FREE Blimpie Sub With Purchase! Do you live near a Blimpie?? If so, you’ll want to head over here to join their Email club. After you do, you will get a coupon for a FREE Regular Sub with the purchase of a Regular Sub and Drink.